Chinese fest going on in my blog ? Well, today’s theme in the FB food group was cabbage . Cabbage upkari,cabbage sukkhe ,cabbage ambado was a big NO to me , atleast not today. Not that I don’t like it ,but not today I wanted something new and innovative . So planned for cabbage and bell pepper pakode ,still not satisfied and not enough enthusiasm . Finally,Sanju,my princess,read my mind and came to my rescue . She suggested , Amma , cabbage momos . Aha! there came a Million dollar smile on my face and I started my job with zeal . Now the question was, what were the leftover bellpeppers doing in the fridge? 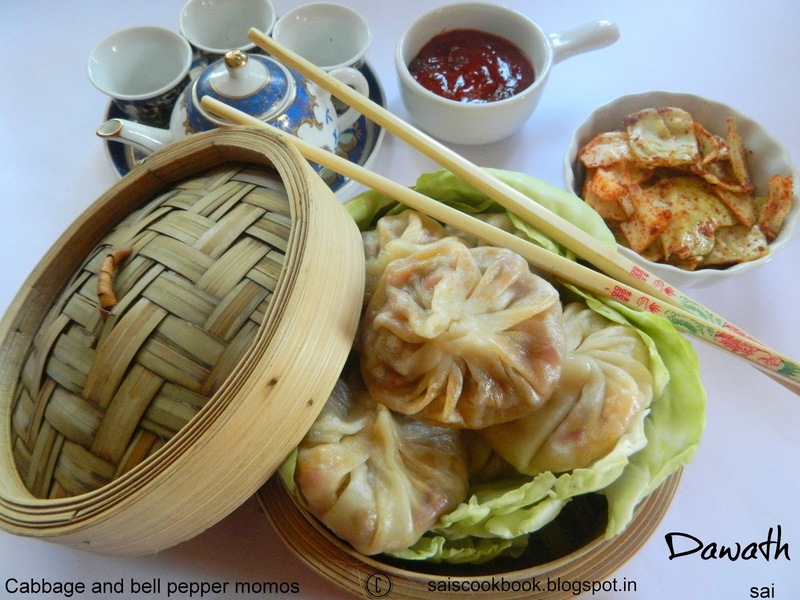 Of course it was for the momos to contrast with the cabbage ….As I mentioned earlier,Chinese is the all time favorite at our place and this dish is absolutely healthy with veggies and less oil,and overall steamed dumplings.With great difficulty I shot the pics since my hungry cubs were ready to attack. 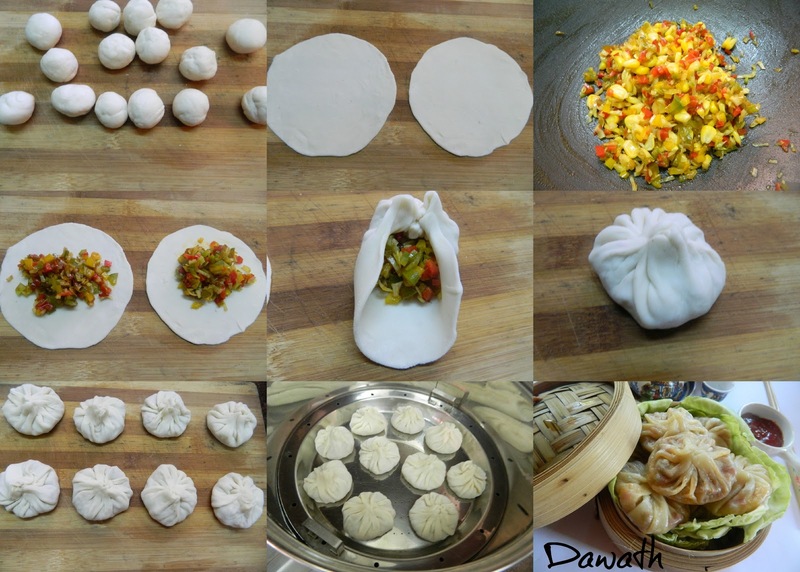 Finally I shot the pics and my folks gulped the dumplings in a jiffy . 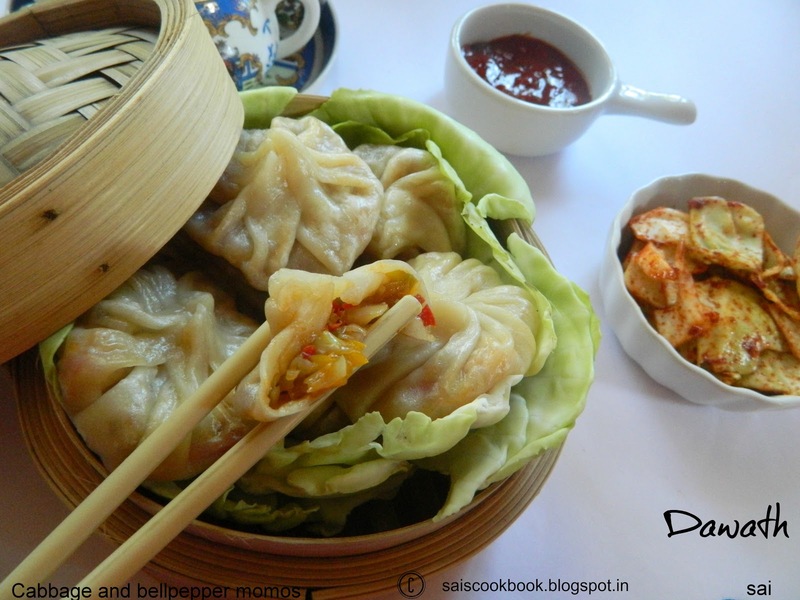 Momos are common in Chinese,Nepal and Eastern part of India .You may make your own stuffings of your choice like shredded chicken,mixed veggies etc. 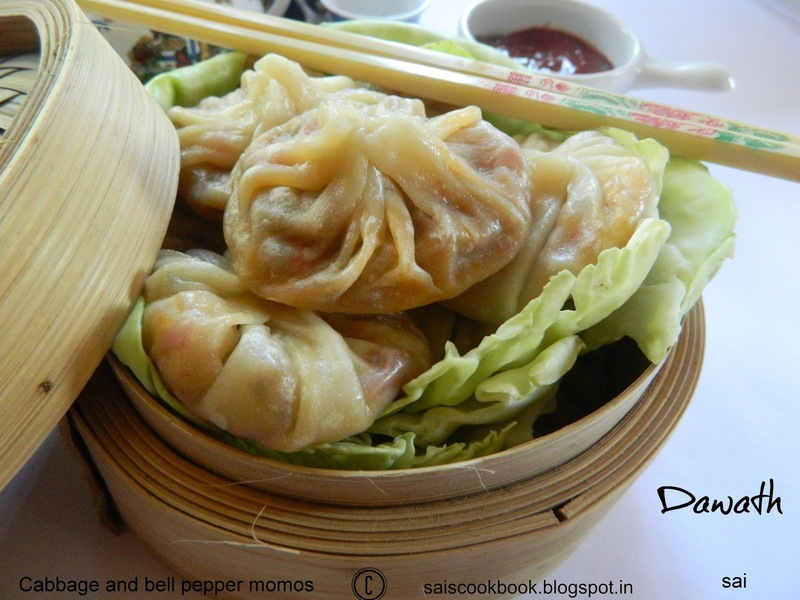 Momos makes the best chinese starter . Mix maida,baking powder and salt and knead it to a stiff dough with water,just like a puri dough. (not very hard nor soft). Keep it aside for 20 minutes by covering it in a damp cloth. 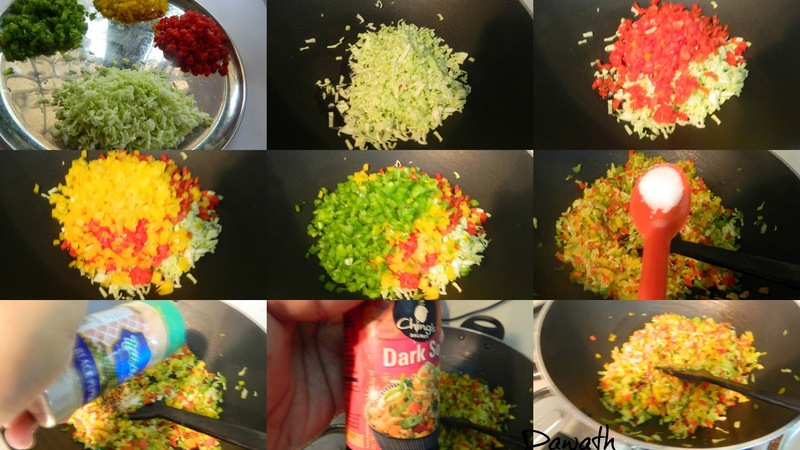 Meanwhile take a tsp of oil and saute cabbage and bell peppers for 5 minutes on high flame. Add all the spices and salt to taste and saute for a minute and lastly add soya sauce and stir for a minute and off the flame. Make lemon sized round balls and roll into small,thin,translucent discs(4″ to 5″). Add 1 tsp stuffing in the centre of the puri,and bring the edges together to cover the filling just like you drape the pleats of the saree. Seal it completely and steam it in a steamer for 5-6 minutes. 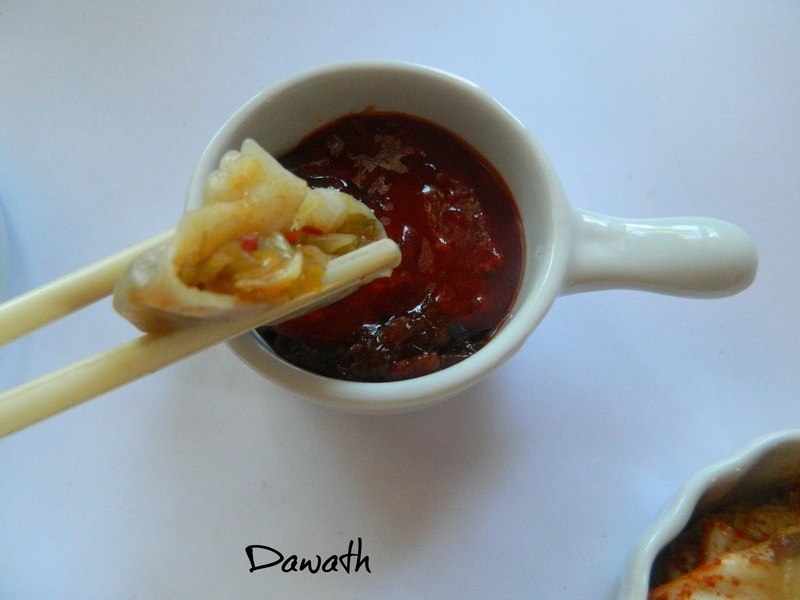 Serve it with kimchi salad and sweet chilly sauce.